Anaphylaxis and severe hypersensitivity reactions characterized by dyspnea and hypotension requiring treatment, angioedema, and generalized urticaria have occurred in 2 to 4% of patients receiving paclitaxel in clinical trials. Fatal reactions have occurred in patients despite premedication. All patients should be pretreated with corticosteroids, diphenhydramine, and H2 antagonists (see DOSAGE AND ADMINISTRATION). Patients who experience severe hypersensitivity reactions to paclitaxel should not be rechallenged with the drug. 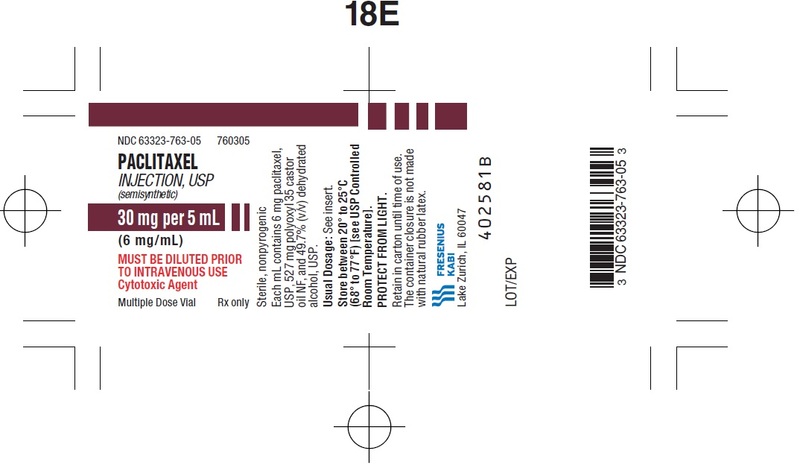 Paclitaxel Injection, USP is a clear, colorless to slightly yellow viscous solution. It is supplied as a nonaqueous solution intended for dilution with a suitable parenteral fluid prior to intravenous infusion. 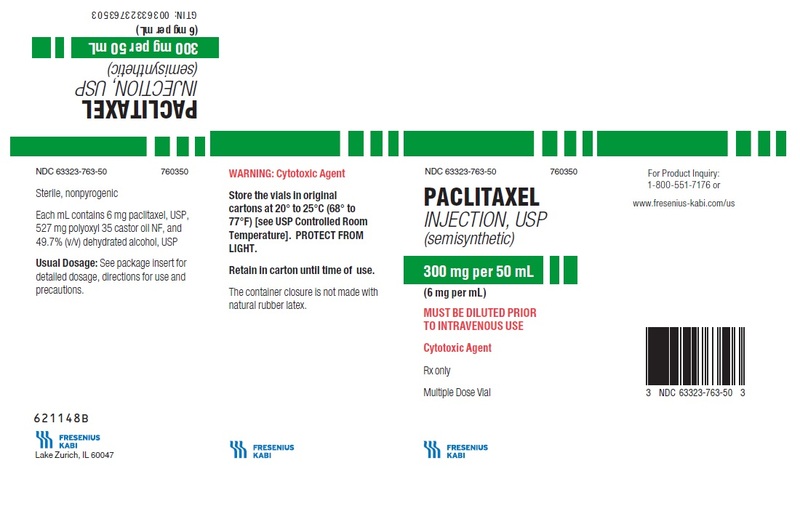 Paclitaxel Injection, USP is available in 30 mg (5 mL), 100 mg (16.7 mL), and 300 mg (50 mL) multidose vials. Each mL of sterile nonpyrogenic solution contains 6 mg paclitaxel, USP, 527 mg of polyoxyl 35 castor oil, NF, and 49.7% (v/v) dehydrated alcohol, USP. Paclitaxel is a natural product with antitumor activity. Paclitaxel is obtained via a semi-synthetic process from Taxus baccata. 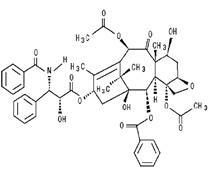 The chemical name for paclitaxel is (2aR,4S,4aS,6R,9S,11S,12S,12aR,12bS)-1,2a,3,4,4a,6,9,10,11,12, 12a,12b-Dodecahydro-4,6,9,11,12,12b-hexahydroxy-4a,8,13, 13-tetramethyl-7,11-methano-5H-cyclodeca[3,4]-benz[1,2-b] oxet-5-one 6,12b-diacetate, 12-benzoate, 9-ester with (2R,3S)- N-benzoyl-3-phenylisoserine. Paclitaxel, USP is a white to off-white powder with the empirical formula C47H51NO14 and a molecular weight of 853.9. It is insoluble in water, soluble in alcohol and melts at around 212°C to 217°C. Paclitaxel is a novel antimicrotubule agent that promotes the assembly of microtubules from tubulin dimers and stabilizes microtubules by preventing depolymerization. This stability results in the inhibition of the normal dynamic reorganization of the microtubule network that is essential for vital interphase and mitotic cellular functions. In addition, paclitaxel induces abnormal arrays or â€œbundlesâ€ of microtubules throughout the cell cycle and multiple asters of microtubules during mitosis. It appeared that with the 24-hour infusion of paclitaxel, a 30% increase in dose (135 mg/m2 vs 175 mg/m2) increased the Cmax by 87%, whereas the AUC (0-âˆž) remained proportional. However, with a 3-hour infusion, for a 30% increase in dose, the Cmax and AUC (0-âˆž) were increased by 68% and 89%, respectively. The mean apparent volume of distribution at steady state, with the 24-hour infusion of paclitaxel, ranged from 227 to 688 L/m2, indicating extensive extravascular distribution and/or tissue binding of paclitaxel. The pharmacokinetics of paclitaxel were also evaluated in adult cancer patients who received single doses of 15 to 135 mg/m2 given by 1-hour infusions (n=15), 30 to 275 mg/m2 given by 6-hour infusions (n=36), and 200 to 275 mg/m2 given by 24-hour infusions (n=54) in Phase 1 and 2 studies. Values for CLT and volume of distribution were consistent with the findings in the Phase 3 study. The pharmacokinetics of paclitaxel in patients with AIDS-related Kaposi's sarcoma have not been studied. After intravenous administration of 15 to 275 mg/m2 doses of paclitaxel as 1-, 6-, or 24-hour infusions, mean values for cumulative urinary recovery of unchanged drug ranged from 1.3% to 12.6% of the dose, indicating extensive non-renal clearance. In 5 patients administered a 225 or 250 mg/m2 dose of radiolabeled paclitaxel as a 3-hour infusion, a mean of 71% of the radioactivity was excreted in the feces in 120 hours, and 14% was recovered in the urine. Total recovery of radioactivity ranged from 56% to 101% of the dose. Paclitaxel represented a mean of 5% of the administered radioactivity recovered in the feces, while metabolites, primarily 6Î±-hydroxypaclitaxel, accounted for the balance. In vitro studies with human liver microsomes and tissue slices showed that paclitaxel was metabolized primarily to 6Î±-hydroxypaclitaxel by the cytochrome P450 isozyme CYP2C8; and to 2 minor metabolites, 3â€™-p-hydroxypaclitaxel and 6Î±, 3â€™-p-dihydroxypaclitaxel, by CYP3A4. In vitro, the metabolism of paclitaxel to 6Î±-hydroxypaclitaxel was inhibited by a number of agents (ketoconazole, verapamil, diazepam, quinidine, dexamethasone, cyclosporin, teniposide, etoposide, and vincristine), but the concentrations used exceeded those found in vivo following normal therapeutic doses. Testosterone, 17Î±-ethinyl estradiol, retinoic acid, and quercetin, a specific inhibitor of CYP2C8, also inhibited the formation of 6Î±-hydroxypaclitaxel in vitro. The pharmacokinetics of paclitaxel may also be altered in vivo as a result of interactions with compounds that are substrates, inducers, or inhibitors of CYP2C8 and/or CYP3A4 (see PRECAUTIONS, Drug Interactions). The disposition and toxicity of paclitaxel 3-hour infusion were evaluated in 35 patients with varying degrees of hepatic function. Relative to patients with normal bilirubin, plasma paclitaxel exposure in patients with abnormal serum bilirubin â‰¤2 times upper limit of normal (ULN) administered 175 mg/m2 was increased, but with no apparent increase in the frequency or severity of toxicity. In 5 patients with serum total bilirubin >2 times ULN, there was a statistically nonsignificant higher incidence of severe myelosuppression, even at a reduced dose (110 mg/m2), but no observed increase in plasma exposure (see PRECAUTIONS, Hepatic and DOSAGE AND ADMINISTRATION). The effect of renal or hepatic dysfunction on the disposition of paclitaxel has not been investigated. The safety and efficacy of paclitaxel followed by cisplatin in patients with advanced ovarian cancer and no prior chemotherapy were evaluated in 2, Phase 3 multicenter, randomized, controlled trials. In an Intergroup study led by the European Organization for Research and Treatment of Cancer involving the Scandinavian Group NOCOVA, the National Cancer Institute of Canada, and the Scottish Group, 680 patients with Stage IIBâ€“C, III, or IV disease (optimally or non-optimally debulked) received either paclitaxel 175 mg/m2 infused over 3 hours followed by cisplatin 75 mg/m2 (Tc) or cyclophosphamide 750 mg/m2 followed by cisplatin 75 mg/m2 (Cc) for a median of 6 courses. Although the protocol allowed further therapy, only 15% received both drugs for 9 or more courses. In a study conducted by the Gynecological Oncology Group (GOG), 410 patients with Stage III or IV disease (>1 cm residual disease after staging laparotomy or distant metastases) received either paclitaxel 135 mg/m2 infused over 24 hours followed by cisplatin 75 mg/m2 or cyclophosphamide 750 mg/m2 followed by cisplatin 75 mg/m2 for 6 courses. In both studies, patients treated with paclitaxel in combination with cisplatin had significantly higher response rate, longer time to progression, and longer survival time compared with standard therapy. These differences were also significant for the subset of patients in the Intergroup study with non-optimally debulked disease, although the study was not fully powered for subset analyses (TABLES 2A and 2B). 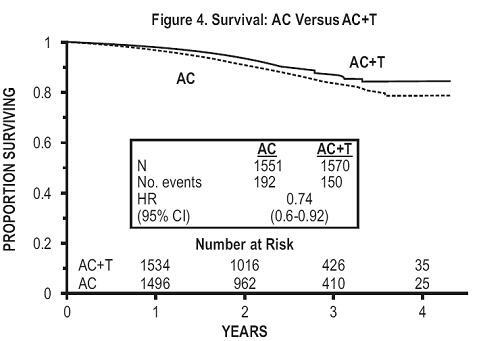 Kaplan- Meier survival curves for each study are shown in FIGURES 1 and 2. The adverse event profile for patients receiving paclitaxel in combination with cisplatin in these studies was qualitatively consistent with that seen for the pooled analysis of data from 812 patients treated with single-agent paclitaxel in 10 clinical studies. These adverse events and adverse events from the Phase 3 first-line ovarian carcinoma studies are described in the ADVERSE REACTIONSsection in tabular (TABLES 10 and 11) and narrative form. Data from 5, Phase 1 and 2 clinical studies (189 patients), a multicenter randomized Phase 3 study (407 patients), as well as an interim analysis of data from more than 300 patients enrolled in a treatment referral center program were used in support of the use of paclitaxel in patients who have failed initial or subsequent chemotherapy for metastatic carcinoma of the ovary. Two of the Phase 2 studies (92 patients) utilized an initial dose of 135 to 170 mg/m2 in most patients (>90%) administered over 24 hours by continuous infusion. Response rates in these 2 studies were 22% (95% CI, 11 to 37%) and 30% (95% CI, 18 to 46%) with a total of 6 complete and 18 partial responses in 92 patients. The median duration of overall response in these 2 studies measured from the first day of treatment was 7.2 months (range, 3.5 to 15.8 months) and 7.5 months (range, 5.3 to 17.4 months), respectively. The median survival was 8.1 months (range, 0.2 to 36.7 months) and 15.9 months (range, 1.8 to 34.5+ months). The Phase 3 study had a bifactorial design and compared the efficacy and safety of paclitaxel, administered at 2 different doses (135 or 175 mg/m2) and schedules (3- or 24-hour infusion). The overall response rate for the 407 patients was 16.2% (95% CI, 12.8 to 20.2%), with 6 complete and 60 partial responses. 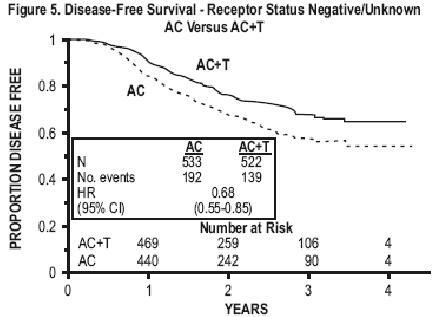 Duration of response, measured from the first day of treatment was 8.3 months (range, 3.2 to 21.6 months). Median time to progression was 3.7 months (range, 0.1+ to 25.1+ months). 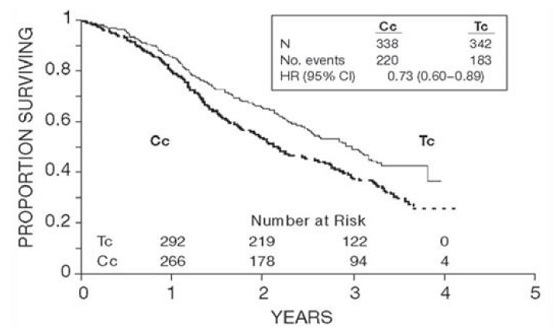 Median survival was 11.5 months (range, 0.2 to 26.3+ months). Analyses were performed as planned by the bifactorial study design described in the protocol, by comparing the 2 doses (135 or 175 mg/m2) irrespective of the schedule (3 or 24 hours) and the 2 schedules irrespective of dose. Patients receiving the 175 mg/m2 dose had a response rate similar to that for those receiving the 135 mg/m2 dose: 18% versus 14% (p=0.28). No difference in response rate was detected when comparing the 3-hour with the 24-hour infusion: 15% versus 17% (p=0.50). Patients receiving the 175 mg/m2 dose of paclitaxel had a longer time to progression than those receiving the 135 mg/m2 dose: median 4.2 versus 3.1 months (p=0.03). The median time to progression for patients receiving the 3-hour versus the 24-hour infusion was 4 months versus 3.7 months, respectively. Median survival was 11.6 months in patients receiving the 175 mg/m2 dose of paclitaxel and 11 months in patients receiving the 135 mg/m2 dose (p=0.92). Median survival was 11.7 months for patients receiving the 3-hour infusion of paclitaxel and 11.2 months for patients receiving the 24-hour infusion (p=0.91). These statistical analyses should be viewed with caution because of the multiple comparisons made. The adverse event profile in this Phase 3 study was consistent with that seen for the pooled analysis of data from 812 patients treated in 10 clinical studies. These adverse events and adverse events from the Phase 3 second-line ovarian carcinoma study are described in the ADVERSE REACTIONSsection in tabular (TABLES 10 and 12) and narrative form. The results of this randomized study support the use of paclitaxel at doses of 135 to 175 mg/m2, administered by a 3-hour intravenous infusion. The same doses administered by 24-hour infusion were more toxic. However, the study had insufficient power to determine whether a particular dose and schedule produced superior efficacy. A Phase 3 Intergroup study (Cancer and Leukemia Group B [CALGB], Eastern Cooperative Oncology Group [ECOG], North Central Cancer Treatment Group [NCCTG], and Southwest Oncology Group [SWOG]) randomized 3,170 patients with node-positive breast carcinoma to adjuvant therapy with paclitaxel or to no further chemotherapy following 4 courses of doxorubicin and cyclophosphamide (AC). This multicenter trial was conducted in women with histologically positive lymph nodes following either a mastectomy or segmental mastectomy and nodal dissections. 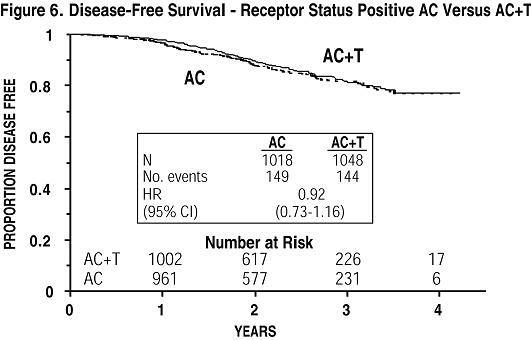 The 3 x 2 factorial study was designed to assess the efficacy and safety of 3 different dose levels of doxorubicin (A) and to evaluate the effect of the addition of paclitaxel administered following the completion of AC therapy. After stratification for the number of positive lymph nodes (1 to 3, 4 to 9, or 10+), patients were randomized to receive cyclophosphamide at a dose of 600 mg/m2 and doxorubicin at doses of either 60 mg/m2 (on day 1), 75 mg/m2 (in 2 divided doses on days 1 and 2), or 90 mg/m2 (in 2 divided doses on days 1 and 2 with prophylactic G-CSF support and ciprofloxacin) every 3 weeks for 4 courses and either paclitaxel 175 mg/m2 as a 3-hour infusion every 3 weeks for 4 additional courses or no additional chemotherapy. Patients whose tumors were positive were to receive subsequent tamoxifen treatment (20 mg daily for 5 years); patients who received segmental mastectomies prior to study were to receive breast irradiation after recovery from treatment-related toxicities. At the time of the current analysis, median follow-up was 30.1 months. Of the 2,066 patients who were hormone receptor positive, 93% received tamoxifen. 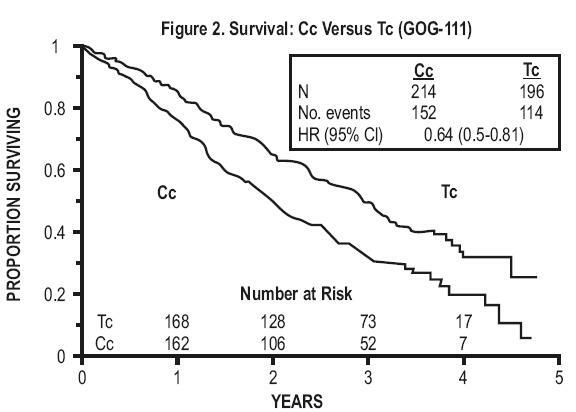 The primary analyses of disease-free survival and overall survival used multivariate Cox models, which included paclitaxel administration, doxorubicin dose, number of positive lymph nodes, tumor size, menopausal status, and estrogen receptor status as factors. 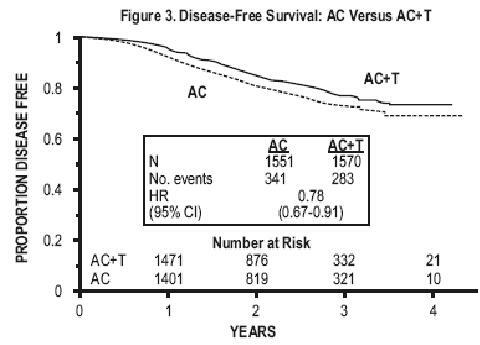 Based on the model for disease-free survival, patients receiving AC followed by paclitaxel had a 22% reduction in the risk of disease recurrence compared to patients randomized to AC alone (Hazard Ratio [HR]=0.78, 95% CI, 0.67 to 0.91, p=0.0022). They also had a 26% reduction in the risk of death (HR=0.74, 95% CI, 0.60 to 0.92, p=0.0065). For disease-free survival and overall survival, p-values were not adjusted for interim analyses. Kaplan-Meier curves are shown in FIGURES 3 and 4. Increasing the dose of doxorubicin higher than 60 mg/m2 had no effect on either disease-free are shown in FIGURE 3 survival or overall survival. The adverse event profile for the patients who received paclitaxel subsequent to AC was consistent with that seen in the pooled analysis of data from 812 patients (TABLE 10) treated with single-agent paclitaxel in 10 clinical studies. These adverse events are described in the ADVERSE REACTIONSsection in tabular (TABLES 10 and 13) and narrative form. The adverse event profile of the patients who received single-agent Paclitaxel Injection, USP, in the Phase 3 study was consistent with that seen for the pooled analysis of data from 812 patients treated in 10 clinical studies. These adverse events and adverse events from the Phase 3 breast carcinoma study are described in the ADVERSE REACTIONSsection in tabular (TABLES 10 and 14) and narrative form. The adverse event profile for patients who received paclitaxel in combination with cisplatin in this study was generally consistent with that seen for the pooled analysis of data from 812 patients treated with single-agent paclitaxel in 10 clinical studies. These adverse events and adverse events from the Phase 3 first-line NSCLC study are described in the ADVERSE REACTIONSsection in tabular (TABLES 10 and 15) and narrative form. Most data on patient benefit were assessed retrospectively (plans for such analyses were not included in the study protocols). Nonetheless, clinical descriptions and photographs indicated clear benefit in some patients, including instances of improved pulmonary function in patients with pulmonary involvement, improved ambulation, resolution of ulcers, and decreased analgesic requirements in patients with Kaposiâ€™s sarcoma (KS) involving the feet and resolution of facial lesions and edema in patients with KS involving the face, extremities, and genitalia. The adverse event profile of paclitaxel administered to patients with advanced HIV disease and poor-risk AIDS-related Kaposi's sarcoma was generally similar to that seen in the pooled analysis of data from 812 patients with solid tumors. These adverse events and adverse events from the Phase 2 second-line Kaposi's sarcoma studies are described in the ADVERSE REACTIONSsection in tabular (TABLES 10 and 16) and narrative form. In this immunosuppressed patient population, however, a lower dose intensity of paclitaxel and supportive therapy including hematopoietic growth factors in patients with severe neutropenia are recommended. Patients with AIDS-related Kaposiâ€™s sarcoma may have more severe hematologic toxicities than patients with solid tumors. Paclitaxel Injection, USP is indicated as subsequent therapy for the treatment of advanced carcinoma of the ovary. As first-line therapy, Paclitaxel Injection, USP is indicated in combination with cisplatin. Paclitaxel Injection, USP is indicated for the adjuvant treatment of node-positive breast cancer administered sequentially to standard doxorubicin-containing combination chemotherapy. 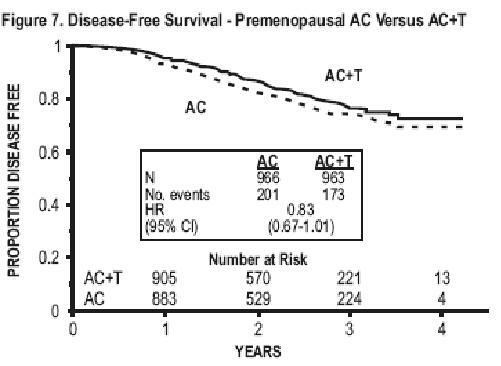 In the clinical trial, there was an overall favorable effect on disease-free and overall survival in the total population of patients with receptor-positive and receptor-negative tumors, but the benefit has been specifically demonstrated by available data (median follow-up 30 months) only in the patients with estrogen and progesterone receptor-negative tumors (see CLINICAL STUDIES, Breast Carcinoma). Paclitaxel Injection, USP, in combination with cisplatin, is indicated for the first-line treatment of non-small cell lung cancer in patients who are not candidates for potentially curative surgery and/or radiation therapy. Paclitaxel Injection, USP is indicated for the second-line treatment of AIDS-related Kaposi's sarcoma. Paclitaxel is contraindicated in patients who have a history of hypersensitivity reactions to paclitaxel or other drugs formulated in polyoxyl 35 castor oil. Paclitaxel should not be used in patients with solid tumors who have baseline neutrophil counts of <1,500 cells/mm3 or in patients with AIDS-related Kaposi's sarcoma with baseline neutrophil counts of <1,000 cells/mm3. Paclitaxel can cause fetal harm when administered to a pregnant woman. Administration of paclitaxel during the period of organogenesis to rabbits at doses of 3 mg/kg/day (about 0.2 the daily maximum recommended human dose on a mg/m2 basis) caused embryo-and fetotoxicity, as indicated by intrauterine mortality, increased resorptions, and increased fetal deaths. Maternal toxicity was also observed at this dose. No teratogenic effects were observed at 1 mg/kg/day (about 1/15 the daily maximum recommended human dose on a mg/m2 basis); teratogenic potential could not be assessed at higher doses due to extensive fetal mortality. There are no adequate and well-controlled studies in pregnant women. If paclitaxel is used during pregnancy, or if the patient becomes pregnant while receiving this drug, the patient should be apprised of the potential hazard to the fetus. Women of child-bearing potential should be advised to avoid becoming pregnant. Contact of the undiluted concentrate with plasticized polyvinyl chloride (PVC) equipment or devices used to prepare solutions for infusion is not recommended. In order to minimize patient exposure to the plasticizer DEHP [di-(2-ethylhexyl)phthalate], which may be leached from PVC infusion bags or sets, diluted paclitaxel solutions should preferably be stored in bottles (glass, polypropylene) or plastic bags (polypropylene, polyolefin) and administered through polyethylene-lined administration sets. Paclitaxel should be administered through an in-line filter with a microporous membrane not greater than 0.22 microns. Use of filter devices such as IVEX-2® filters which incorporate short inlet and outlet PVC-coated tubing has not resulted in significant filter devices such leaching of DEHP. The metabolism of paclitaxel is catalyzed by cytochrome P450 isoenzymes CYP2C8 and CYP3A4. Caution should be exercised when administering paclitaxel concomitantly with known substrates or inhibitors of the cytochrome P450 isoenzymes CYP2C8 and CYP3A4. Caution should be exercised when paclitaxel is concomitantly administered with known substrates (e.g., midazolam, buspirone, felodipine, lovastatin, eletriptan, sildenafil, simvastatin, and triazolam), inhibitors (e.g., atazanavir, clarithromycin, indinavir, itraconazole, ketoconazole, nefazodone, nelfinavir, ritonavir, saquinavir, and telithromycin), and inducers (e.g., rifampin and carbamazepine) of CYP3A4 (see CLINICAL PHARMACOLOGY). Paclitaxel therapy should not be administered to patients with baseline neutrophil counts of less than 1,500 cells/mm3. In order to monitor the occurrence of myelotoxicity, it is recommended that frequent peripheral blood cell counts be performed on all patients receiving paclitaxel. Patients should not be re-treated with subsequent cycles of paclitaxel until neutrophils recover to a level >1,500 cells/mm3 and platelets recover to a level >100,000 cells/mm3. In the case of severe neutropenia (<500 cells/mm3 for 7 days or more) during a course of paclitaxel therapy, a 20% reduction in dose for subsequent courses of therapy is recommended. Patients with a history of severe hypersensitivity reactions to products containing polyoxyl 35 castor oil (e.g., cyclosporin for injection concentrate and teniposide for injection concentrate) should not be treated with paclitaxel. In order to avoid the occurrence of severe hypersensitivity reactions, all patients treated with paclitaxel should be premedicated with corticosteroids (such as dexamethasone), diphenhydramine and H antagonists (such as cimetidine or ranitidine). Minor symptoms such as flushing, skin reactions, dyspnea, hypotension, or tachycardia do not require interruption of therapy. However, severe reactions, such as hypotension requiring treatment, dyspnea requiring bronchodilators, angioedema, or generalized urticaria require immediate discontinuation of paclitaxel and aggressive symptomatic therapy. Patients who have developed severe hypersensitivity reactions should not be rechallenged with paclitaxel. Hypotension, bradycardia, and hypertension have been observed during administration of paclitaxel, but generally do not require treatment. Occasionally paclitaxel infusions must be interrupted or discontinued because of initial or recurrent hypertension. Frequent vital sign monitoring, particularly during the first hour of paclitaxel infusion, is recommended. Continuous cardiac monitoring is not required except for patients with serious conduction abnormalities (see WARNINGS). When paclitaxel is used in combination with doxorubicin for treatment of metastatic breast cancer, monitoring of cardiac function is recommended (see ADVERSE REACTIONS). 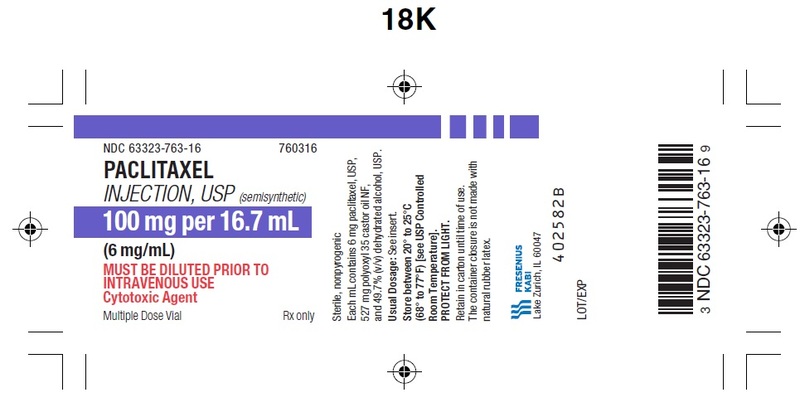 Paclitaxel contains dehydrated alcohol USP, 396 mg/mL; consideration should be given to possible CNS and other effects of alcohol (see PRECAUTIONS, Pediatric Use). Injection site reactions, including reactions secondary to extravasation, were usually mild and consisted of erythema, tenderness, skin discoloration, or swelling at the injection site. These reactions have been observed more frequently with the 24-hour infusion than with the 3-hour infusion. Recurrence of skin reactions at a site of previous extravasation following administration of paclitaxel at a different site, i.e., â€œrecallâ€, has been reported. More severe events such as phlebitis, cellulitis, induration, skin exfoliation, necrosis, and fibrosis have been reported. In some cases, the onset of the injection site reaction either occurred during a prolonged infusion or was delayed by a week to 10 days. Administration of paclitaxel prior to and during mating produced impairment of fertility in male and female rats at doses equal to or greater than 1 mg/kg/day (about 0.04 the daily maximum recommended human dose on a mg/m2 basis). At this dose, to or greater than 1 mg/kg/day (about 0.04 the daily maximum recommended human dose on a mg/m2 basis). At this paclitaxel caused reduced fertility and reproductive indices, and increased embryo- and fetotoxicity (see WARNINGS). There have been reports of central nervous system (CNS) toxicity (rarely associated with death) in a clinical trial in pediatric patients in which paclitaxel was infused intravenously over 3 hours at doses ranging from 350 mg/m2 to 420 mg/m2. The toxicity is most likely attributable to the high dose of the ethanol component of the paclitaxel vehicle given over a short infusion time. The use of concomitant antihistamines may intensify this effect. Although a direct effect of the paclitaxel itself cannot be discounted, the high doses used in this study (over twice the recommended adult dosage) must be considered in assessing the discounted, the high doses used in this study safety of paclitaxel for use in this population. Of 2,228 patients who received paclitaxel in 8 clinical studies evaluating its safety and effectiveness in the treatment of advanced ovarian cancer, breast carcinoma, or NSCLC, and 1,570 patients who were randomized to receive paclitaxel in the adjuvant breast cancer study, 649 patients (17%) were 65 years or older and 49 patients (1%) were 75 years or older. In most studies, severe myelosuppression was more frequent in elderly patients; in some studies, severe neuropathy was more common in elderly patients. In 2 clinical studies in NSCLC, the elderly patients treated with paclitaxel had a higher incidence of cardiovascular events. Estimates of efficacy appeared similar in elderly patients and in younger patients; however, comparative efficacy cannot be determined with confidence due to the small number of elderly patients studied. In a study of first-line treatment of ovarian cancer, elderly patients had a lower median survival than younger patients, but no other efficacy parameters favored the younger group. TABLE 9 presents the incidences of Grade IV neutropenia and severe neuropathy in clinical studies according to age. Data in the following table are based on the experience of 812 patients (493 with ovarian carcinoma and 319 with breast carcinoma) enrolled in 10 studies who received single-agent paclitaxel injection. Two hundred and seventy-five patients were treated in 8, Phase 2 studies with paclitaxel doses ranging from 135 to 300 mg/m2 administered over 24 hours (in 4 of these studies, G-CSF was administered as hematopoietic support). 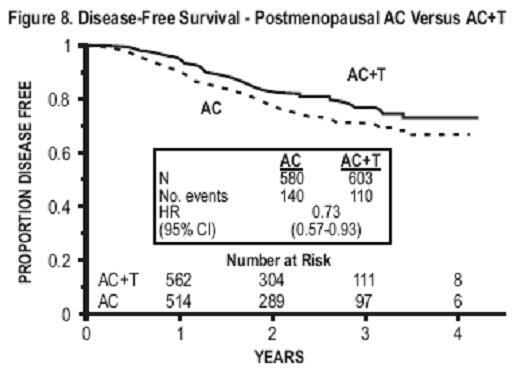 Three hundred and one patients were treated in the randomized Phase 3 ovarian carcinoma study which compared 2 doses (135 or 175 mg/m2) and 2 schedules (3 or 24 hours) of paclitaxel. Two hundred and thirty-six patients with breast carcinoma received paclitaxel (135 or 175 mg/m2) administered over 3 hours in a controlled study. â€ Severe events are defined as at least Grade III toxicity. For the 1,084 patients who were evaluable for safety in the Phase 3 first-line ovary combination therapy studies, TABLE 11 shows the incidence of important adverse events. For both studies, the analysis of safety was based on all courses of therapy (6 courses for the GOG-111 study and up to 9 courses for the Intergroup study). For the 403 patients who received single-agent paclitaxel injection in the Phase 3 second-line ovarian carcinoma study, the following table shows the incidence of important adverse events. For the Phase 3 adjuvant breast carcinoma study, the following table shows the incidence of important severe adverse events for the 3,121 patients (total population) who were evaluable for safety as well as for a group of 325 patients (early population) who, per the study protocol, were monitored more intensively than other patients. The frequency and severity of important adverse events for the Phase 3 ovarian carcinoma, breast carcinoma, NSCLC, and the Phase 2 Kaposiâ€™s sarcoma carcinoma studies are presented above in tabular form by treatment arm. In addition, rare events have been reported from postmarketing experience or from other clinical studies. The frequency and severity of adverse events have been generally similar for patients receiving paclitaxel for the treatment of ovarian, breast, or lung carcinoma or Kaposiâ€™s sarcoma, but patients with AIDS-related Kaposiâ€™s sarcoma may have more frequent and severe hematologic toxicity, infections (including opportunistic infections, see TABLE 16), and febrile neutropenia. These patients require a lower dose intensity and supportive care (see CLINICAL STUDIES, AIDS-Related Kaposi's Sarcoma). Toxicities that were observed only in or were noted to have occurred with greater severity in the population with Kaposi's sarcoma and that occurred with a difference that was clinically significant in this population are described. Elevated liver function tests and renal toxicity have a higher incidence in KS patients as compared to patients with solid tumors. Bone marrow suppression was the major dose-limiting toxicity of paclitaxel. Neutropenia, the most important hematologic toxicity, was dose and schedule dependent and was generally rapidly reversible. Among patients treated in the Phase 3 second line ovarian study with a 3- hour infusion, neutrophil counts declined below 500 cells/mm3 in 14% of the patients treated with a dose of 135 mg/m2 compared to 27% at a dose of 175 mg/m2 (p=0.05). In the same study, severe neutropenia (<500 cells/mm3) was more frequent with the 24-hour than with the 3-hour infusion; infusion duration had a greater impact on myelosuppression than dose. Neutropenia did not appear to increase with cumulative exposure and did not appear to be more frequent nor more severe for patients previously treated with radiation therapy. In the study where paclitaxel was administered to patients with ovarian carcinoma at a dose of 135 mg/m2/24 hours in combination with cisplatin versus the control arm of cyclophosphamide plus cisplatin, the incidences of grade IV neutropenia and of febrile neutropenia were significantly greater in the paclitaxel plus cisplatin arm than in the control arm. Grade IV neutropenia occurred in 81% on the paclitaxel plus cisplatin arm versus 58% on the cyclophosphamide plus cisplatin arm, and febrile neutropenia occurred in 15% and 4% respectively. On the paclitaxel/cisplatin arm, there were 35/1,074 (3%) courses with fever in which Grade IV neutropenia was reported at some time during the course. When paclitaxel followed by cisplatin was administered to patients with advanced NSCLC in the ECOG study, the incidences of Grade IV neutropenia were 74% (paclitaxel 135 mg/m2/24 hours followed by cisplatin) and 65% (paclitaxel 250 mg/m2/24 hours followed by cisplatin and G-CSF) compared with 55% in patients who received cisplatin/etoposide. Fever was frequent (12% of all treatment courses). Infectious episodes occurred in 30% of all patients and 9% of all courses; these episodes were fatal in 1% of all patients, and included sepsis, pneumonia and peritonitis. In the Phase 3 second-line ovarian study, infectious episodes were reported in 20% and 26% of the patients treated with a dose of 135 mg/m2 or 175 mg/m2 given as a 3-hour infusions respectively. Urinary tract infections and upper respiratory tract infections were the most frequently reported infectious complications. In the immunosuppressed patient population with advanced HIV disease and poor-risk AIDS-related Kaposiâ€™s sarcoma, 61% of the patients reported at least one opportunistic infection (see CLINICAL STUDIES, AIDS-Related Kaposi's Sarcoma). The use of supportive therapy, including G-CSF, is recommended for patients who have experienced severe neutropenia (see DOSAGE AND ADMINISTRATION). Thrombocytopenia was reported. Twenty percent of the patients experienced a drop in their platelet count below 100,000 cells/mm3 at least once while on treatment; 7% had a platelet count <50,000 cells/mm3 at the time of their worst nadir. Bleeding episodes were reported in 4% of all courses and by 14% of all patients but most of the hemorrhagic episodes were localized and the frequency of these events was unrelated to the paclitaxel dose and schedule. In the Phase 3 second-line ovarian study, bleeding episodes were reported in 10% of the patients; no patients treated with the 3- hour infusion received platelet transfusions. In the adjuvant breast carcinoma trial, the incidence of severe thrombocytopenia and platelet transfusions increased with higher doses of doxorubicin. Anemia (Hb <11 g/dL) was observed in 78% of all patients and was severe (Hb <8 g/dL) in 16% of the cases. No consistent relationship between dose or schedule and the frequency of anemia was observed. Among all patients with normal baseline hemoglobin, 69% became anemic on study but only 7% had severe anemia. Red cell transfusions were required in 25% of all hemoglobin, 69% became anemic on study but only 7% had severe anemia. Red cell transfusions were required in 25% of all patients and in 12% of those with normal baseline hemoglobin levels. All patients received premedication prior to paclitaxel administration (see WARNINGSand PRECAUTIONS: Hypersensitivity Reactions). The frequency and severity of HSRs were not affected by the dose or schedule of paclitaxel administration. In the Phase 3 second-line ovarian study, the 3-hour infusion was not associated with a greater increase in HSRs when compared to the 24-hour infusion. Hypersensitivity reactions were observed in 20% of all courses and in 41% of all patients. These reactions were severe in less than 2% of the patients and 1% of the courses. No severe reactions were observed after course 3 and severe symptoms occurred generally within the first hour of paclitaxel infusion. The most frequent symptoms observed during these severe reactions were dyspnea, flushing, chest pain, and tachycardia. Abdominal pain, pain in the extremities, diaphoresis, and hypertension were also noted. Significant cardiovascular events possibly related to single-agent paclitaxel occurred in approximately 1% of all patients. These events included syncope, rhythm abnormalities, hypertension, and venous thrombosis. One of the patients with syncope treated with paclitaxel at 175 mg/m2 over 24 hours had progressive hypotension and died. The arrhythmias included asymptomatic ventricular tachycardia, bigeminy and complete AV block requiring pacemaker placement. Among patients with NSCLC treated with paclitaxel in combination with cisplatin in the Phase 3 study, significant cardiovascular events occurred in 12 to 13%. This apparent increase in cardiovascular events is possibly due to an increase in cardiovascular risk factors in patients with lung cancer. Interstitial pneumonia, lung fibrosis, and pulmonary embolism have been reported. Radiation pneumonitis has been reported in patients receiving concurrent radiotherapy. Autonomic neuropathy resulting in paralytic ileus has been reported. Optic nerve and/or visual disturbances (scintillating scotomata) have also been reported, particularly in patients who have received higher doses than those recommended. These effects generally have been reversible. However, reports in the literature of abnormal visual evoked potentials in patients have suggested persistent optic nerve damage. Postmarketing reports of ototoxicity (hearing loss and tinnitus) have also been received. Among the patients treated for Kaposiâ€™s sarcoma with paclitaxel, 5 patients had renal toxicity of grade III or IV severity. One patient with suspected HIV nephropathy of grade IV severity had to discontinue therapy. The other 4 patients had renal insufficiency with reversible elevations of serum creatinine. In patients with poor-risk AIDS-related Kaposiâ€™s sarcoma, nausea/vomiting, diarrhea, and mucositis were reported by 69%, 79%, and 28% of patients, respectively. One-third of patients with Kaposiâ€™s sarcoma complained of diarrhea prior to study start (see CLINICAL STUDIES: AIDS-Related Kaposi's Sarcoma). There is no known antidote for paclitaxel overdosage. The primary anticipated complications of overdosage would consist of bone marrow suppression, peripheral neurotoxicity, and mucositis. Overdoses in pediatric patients may be associated with acute ethanol toxicity (see PRECAUTIONS, Pediatric Use). 1. For previously untreated patients with carcinoma of the ovary, one of the following recommended regimens may be given every 3 weeks. In selecting the appropriate regimen, differences in toxicities should be considered (see TABLE 11 in ADVERSE REACTIONS, Disease-Specific Adverse Event Experiences). 2. Paclitaxel administered intravenously over 24 hours at a dose of 135 mg/m2 followed by cisplatin at a dose of 75 mg/m2. 2. In patients previously treated with chemotherapy for carcinoma of the ovary, paclitaxel has been used at several doses and schedules; however, the optimal regimen is not yet clear. (see CLINICAL STUDIES, Ovarian Carcinoma). The recommended regimen is paclitaxel 135 mg/m2 or 175 mg/m2 administered intravenously over 3 hours every 3 weeks. 1. For the adjuvant treatment of node-positive breast cancer, the recommended regimen is paclitaxel, at a dose of 175 mg/m2 intravenously over 3 hours every 3 weeks for 4 courses administered sequentially to doxorubicin-containing combination chemotherapy. The clinical trial used 4 courses of doxorubicin and cyclophosphamide (see CLINICAL STUDIES, Breast Carcinoma). 2. After failure of initial chemotherapy for metastatic disease or relapse within 6 months of adjuvant chemotherapy, paclitaxel at a dose of 175 mg/m2 administered intravenously over 3 hours every 3 weeks has been shown to be effective. For patients with AIDS-related Kaposiâ€™s sarcoma, paclitaxel administered at a dose of 135 mg/m2 given intravenously over 3 hours every 3 weeks or at a dose of 100 mg/m2 given intravenously over 3 hours every 2 weeks is recommended (dose intensity 45 to 50 mg/m2/week). In the 2 clinical trials evaluating these schedules (see CLINICAL STUDIES, AIDS-Related Kaposi'sSarcoma), the former schedule (135 mg/m2 every 3 weeks) was more toxic than the latter. In addition, all patients with low performance status were treated with the latter schedule (100 mg/m2 every 2 weeks). 4. Initiate concomitant hematopoietic growth factor (G-CSF) as clinically indicated. For the therapy of patients with solid tumors (ovary, breast and NSCLC), courses of paclitaxel should not be repeated until the neutrophil count is at least 1,500 cells/mm3 and the platelet count is at least 100,000 cells/mm3. Paclitaxel should not be given to patients with AIDS-related Kaposiâ€™s sarcoma if the baseline or subsequent neutrophil count is less than 1,000 cells/mm3. Patients who experience severe neutropenia (neutrophil <500 cells/mm3 for a week or longer) or severe peripheral neuropathy during paclitaxel therapy should have dosage reduced by 20% for subsequent courses of paclitaxel. The incidence of neurotoxicity and the severity of neutropenia increase with dose. Paclitaxel is a cytotoxic anticancer drug and, as with other potentially toxic compounds, caution should be exercised in handling paclitaxel. Adequate puncture technique should be used to reduce the probability of coring. Injection needles or cannulas larger than 21G in diameter tends to promote coring. Stoppers should be punctured slowly in the center of vial stopper. Multiple puncturing at same site, rapid puncturing, puncturing with blunt spiking devices and puncturing near the edge of the stopper increases the probability of coring. The use of gloves is recommended. If paclitaxel solution contacts the skin, wash the skin immediately and thoroughly with soap and water. Following topical exposure, events have included tingling, burning and redness. If paclitaxel contacts mucous membranes, the membranes should be flushed thoroughly with water. Upon inhalation, dyspnea, chest pain, burning eyes, sore throat, and nausea have been reported. Patients with hepatic impairment may be at increased risk of toxicity, particularly grade IIIâ€“IV myelosuppression (see CLINICAL PHARMACOLOGY and PRECAUTIONS, Hepatic). Recommendations for dosage adjustment for the first course of therapy are shown in TABLE 17 for both 3- and 24-hour infusions. Further dose reduction in subsequent courses should be based on individual tolerance. Patients should be monitored closely for the development of profound myelosuppression. a These recommendations are based on dosages for patients without hepatic impairment of 135 mg/m2 over 24 hours or 175 mg/m2 over 3 hours; data are not available to make dose adjustment recommendations for other regimens (eg, for AIDS-related Kaposiâ€™s sarcoma). Procedures for proper handling and disposal of anticancer drugs should be considered. Several guidelines on this subject have been published1-4. To minimize the risk of dermal exposure, always wear impervious gloves when handling vials containing paclitaxel injection. If paclitaxel solution contacts the skin, wash the skin immediately and thoroughly with soap and water. Following topical exposure, events have included tingling, burning, and redness. If paclitaxel contacts mucous membranes, the membranes should be flushed thoroughly with water. Upon inhalation, dyspnea, chest pain, burning eyes, sore throat, and nausea have been reported. Paclitaxel must be diluted prior to infusion. 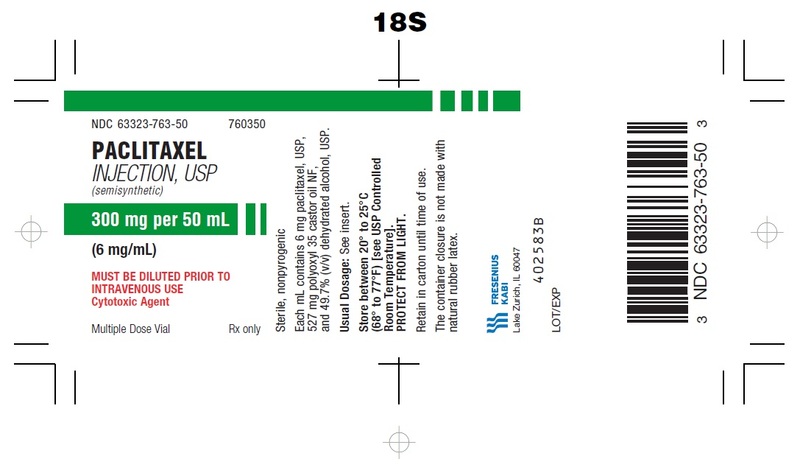 Paclitaxel should be diluted in 0.9% Sodium Chloride Injection, USP; 5% Dextrose Injection, USP; 5% Dextrose and 0.9% Sodium Chloride Injection, USP or 5% Dextrose in Ringerâ€™s Injection to a final concentration of 0.3 to 1.2 mg/mL. The solutions are physically and chemically stable for up to 27 hours at ambient temperature (approximately 25°C) and room lighting conditions. Parenteral drug products should be inspected visually for particulate matter and discoloration prior to administration whenever solution and container permit. The Chemo Dispensing Pinâ„¢ device or similar devices with spikes should not be used with vials of paclitaxel since they can cause the stopper to collapse resulting in loss of sterile integrity of the paclitaxel solution. 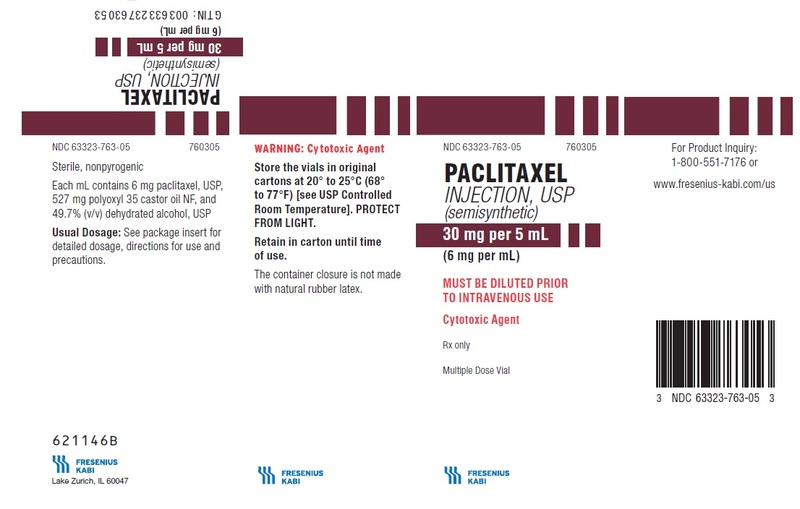 Unopened vials of paclitaxel are stable until the date indicated on the package when stored between 20° to 25°C (68° to 77°F), in the original package. Neither freezing nor refrigeration adversely affects the stability of the product. Upon refrigeration, components in the paclitaxel vial may precipitate, but will redissolve upon reaching room temperature with little or no agitation. There is no impact on product quality under these circumstances. If the solution remains cloudy or if an insoluble precipitate is noted, the vial should be discarded. Solutions for infusion prepared as recommended are stable at ambient temperature (approximately 25°C) and lighting conditions for up to 27 hours. Store the vials in original cartons between 20° to 25°C (68° to 77°F) [see USP Controlled Room Temperature]. Retain in the original package to protect from light. 2. OSHA Technical Manual, TED 1-0.15A, Section VI: Chapter 2. Controlling occupational exposure to hazardous drugs. OSHA, 1999. http://www.osha.gov/dts/osta/otm/otm_vi/otm_vi_2.html. 4. Polovich M, White JM, Kelleher LO, eds. 2005. Chemotherapy and biotherapy guidelines and recommendations for practice. 2nd ed. Pittsburgh, PA: Oncology Nursing Society. Chemo Dispensing Pinâ„¢ is a trademark of B. Braun Medical Incorporated. Serious allergic reactions (anaphylaxis) can happen in people who receive paclitaxel injection. Call your doctor for medical advice about side effects. You may report side effects to FDA at 1-800- FDA-1088 or go to www.fresenius-kabi.com/us or call 1-800-551-7176. 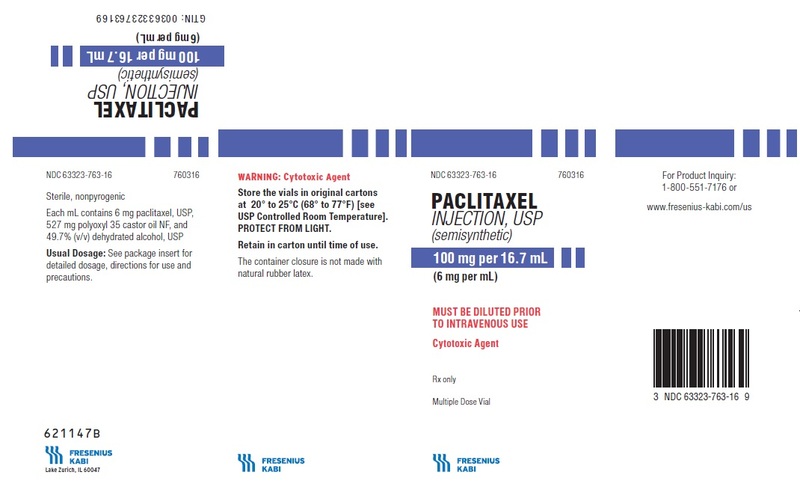 This patient information leaflet summarizes the most important information about paclitaxel. If you would like more information, talk with your healthcare provider. You can ask your pharmacist or healthcare provider for information about paclitaxel that is written for health professionals. For more information go to www.fresenius-kabi.com/us or call 1-800-551-7176. Inactive ingredients include: polyoxyl 35 castor oil, NF and dehydrated alcohol, USP.